Hormozgan Province (Persian: استان هرمزگان‎, Ostān-e Hormozgān) is one of the 31 provinces of Iran. It is in the south of the country, in Iran's Region 2, facing Oman and UAE. Its area is 70,697 km2 (27,296 sq mi), and its provincial capital is Bandar Abbas. The province has fourteen islands in the Persian Gulf and 1,000 km (620 mi) of coastline. The province has 13 major cities: Bandar Abbas, Bandar Lengeh, Hajiabbad, Minab, Qeshm, Sardasht, Sirik, Jask, Bastak, Bandar Khamir, Parsian, Rudan, and Abumusa. The province has 13 counties (or districts), 69 municipalities, and 2,046 villages. In 2011 a little more than 1.5 million people resided in Hormozgan Province. The counties of Hormozgan Province are Parsian County, Bastak County, Bandar Lengeh County, Abumusa County, Qeshm County, Khamir County, Bandar Abbas County, Hajjiabad County, Rudan County, Minab County, Sirik County, Bashagard County & Jask County. Germany has recently[when?] offered to build a bridge that would connect Qeshm island to the mainland, a formidable project. The Historic Bath of Siba—An ancient bath house that is believed dated back to the Sassanid dynasty. 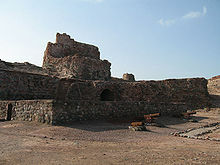 Wikimedia Commons has media related to Hormozgan Province.